Wednesdays 11/7, 11/14, 11/28, 12/5, 12/12, 12/19 from 6:45-7:45pm. No class 11/21 (day before Thanksgiving). $120 for the six week session. This four week session is for beginning aerial silks, all ages. Students will begin learning the fundamentals of aerial silks, including climbs, footlocks, and poses. Class is open to all abilities. Amanda has been practicing aerial for four years, starting with silks. 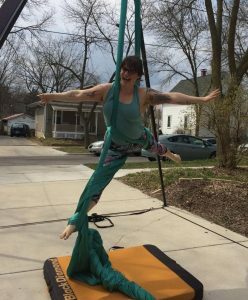 After moving to Madison three years ago she discovered other types of aerials, including lyra, rope, and trapeze. She started teaching this year and is excited to expand her teaching practice! Amanda has done Nimble Arts teacher training and is in the process of completing Born to Fly’s silks and rope teacher certification. Email Amanda at abstromin@gmail.com to register.